1800s-1940s:1st generation Colorado Homesteader: Jennie, married VanSickle Kansas,Cadmus Marcellus Smith in Lenore, Kan, and Vader, Pagosa Sprgs, Colo. CM died at age 50 with the flu in Colo. Children: Edward C. & Pearsonia VanSickle, Esther Smith, and adopted step-children, Helen & Ruth Blevins. Edward died from pneumonia at Camp Custer, Mich after 9/15/18. Jennie Norlin came from Stockhom, Sweden when she was about 12 years of age. 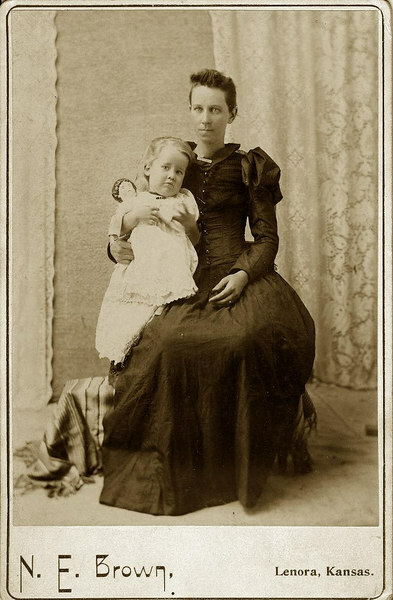 Esther sitting on her mother, Jennie Norlin-Smith, lap in Lenore Kansas.